For a computer nerd like me, you could probably guess that I was be far more interested in this gadget than the cuisine. The thing said “Presto” on the front and “Elacarte” on the back. Putting this together, we get the website of Elacarte, the purveyors of this restaurant tablet technology. Months after the iPad was released on 2010, I remember stories about high-end restaurants showing their wine list via iPads. This tablet goes well beyond that. How was it? Well, confusing, mostly. The hostess told us we could order through the tablet or through her. Since we already knew what we wanted, she just manually took our order and presumably entered it into the system. So, right away, the question is: Do we order through a human or through a computer? Or a combination? Do we have to use the tablet if we don’t want to? 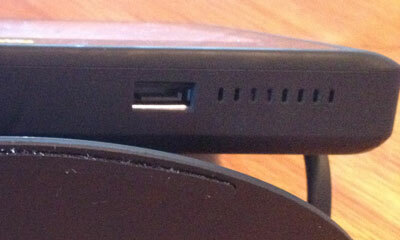 When picking up the tablet, it’s hard not to notice that it is very heavy. At first, I suspected that it was deliberately weighted down as some minor attempt at an anti-theft measure. But then I remembered what I know about power budgets of phones and tablets– powering the screen accounts for much of the battery usage. I realized that this device needs to drive the screen for about 14 continuous hours each day. I.e., the weight must come from a massive battery. That looks to me like an internal SATA connector (different from an eSATA connector). Foolishly, I didn’t have a SATA cable on me so I couldn’t verify. 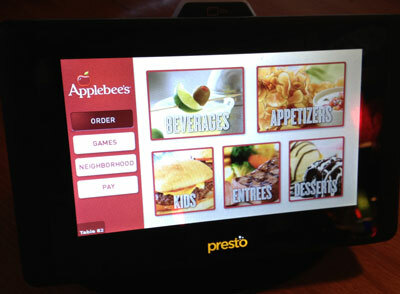 The interface options are: Order, Games, Neighborhood, and Pay. One big benefit of accessing the menu through the Order option is that each menu item can have a picture. For people who order more by picture than text description, this is useful. Rather, it would be, if more items had pictures. I’m not sure there were more pictures than seen in the print menu.